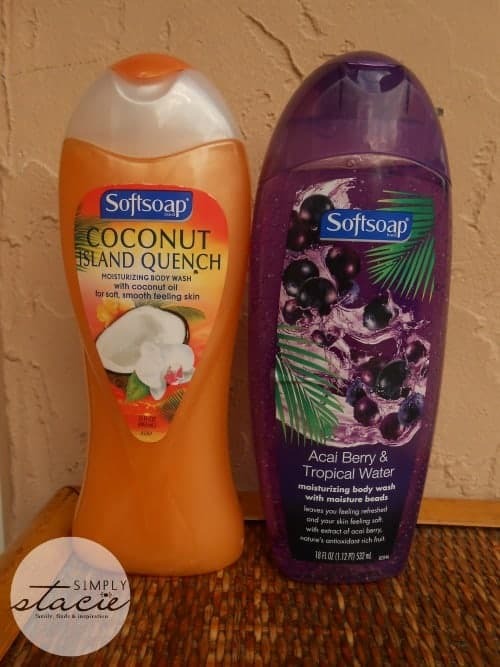 As summer winds down, you can keep all of those tropical memories alive with wonderful moisturizing body washes from Softsoap® including Coconut Island Quench and Acai Berry & Tropical Water! Coconut Island Quench is a creamy body wash that feels luxurious and leaves my skin very soft. It has the tropical scent of the islands with notes of rich coconut that works great to cleanse the skin and I especially like to use it for shaving. My legs are smooth with no dryness at all after using this product. My kids also love a capful of this in their bath water because it makes them feel like they are “at the beach”. My favorite of all of the Softsoap® body washes is the Acai Berry & Tropical Water Moisturizing Body Wash with Moisture Beads. I have very dry skin so I love that this body wash has nourishing acai berry extract and the moisturizing beads leave my skin feeling clean but not stripped of moisture. The fresh fruity scent makes for a delightfully exhilarating shower or bath experience. If you are not ready for summer to go………..then keep the magic alive with the tropical inspired summer fragrances from Softsoap®! I promise you that your skin will “thank you” for it! Softsoap® is a brand that I have come to trust because it is reasonably priced and cleans the skin very nicely. Softsoap® has a full line of products for adults and kids including a fragrance and premium body wash collection, liquid hand soap and bar soap. You are invited to visit Softsoap® to learn more about the product line and check out the latest offerings and special scents. Don’t forget to stock up on the limited edition scents before it is gone too! Which one do you want to try the most? Available from Colgate-Palmolive, Softsoap® products are available online and at major retail locations in the United States and Canada. They sound amazing — the coconut quench is the one that I would LOVE to try! Thank you! I want to try the coconut scrub. sweet honeysuckle and orange peel for me!!! Cherry Blossom & Wild Bamboo body wash. I like the sweet honeysuckle and orange peel scent. i like the softsoap bar soap=coconut scrub. I’d like to try their Cherry Blossom and Wild Bamboo scent. Thanks for the giveaway! I would love to try the Strawberry Smoother Body Butter. Deep cleansing sea mineral hand soap! I’d like to try their Strawberry Smoother body butter wash! I would love to try their Body Wash! I would most love to try the Mositurizing Body Wash in Strawberry Smoother! The coconut scrub bar soap looks like an amazing product. Bring it on! I’d like to try the cherry blossom and bamboo scent. Thanks for the chance. The wild bamboo body wash would be wonderful! Thanks for the giveaway.